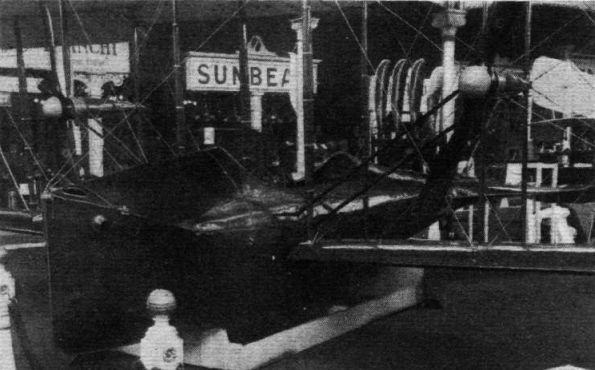 The Perry-Beadle flying boat exhibited at Olympia in 1914. The hull was, if we are not mistaken, built by S. E. Saunders, of Cowes, and was of verv beautiful construction. The lower wing was planked with Saunders "Consuta," the machine being designed without outboard floats, and the idea being that the lower wing should act to steady the machine on the water. In spite of low engine power and consequent heavy power loading, the machine did actually get off the water, but it never became a success. Something of the same idea was incorporated a few years ago by Mr. W. O. Manning in the English Electric Co.'s "Ayr" flying boat, in which also the lower wing was partly submerged when the machine was at rest on the water. S. E. Saunders, of Cowes, built the hull for the first Sopwith "Bat boat." The Perry-Beadle boat shown here was built by him in 1914. The firm is now known as Saunders-Roe.